The collar at the upper end and the navy shade adds an interesting twist to ‘Twinzip’- a reinterpretation an old and popular design. 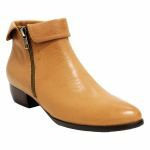 This all weather fashion staple is extremely comfortable with luxurious leather upper, soft leather linings and a perfectly shaped heel. The twin zippers at both ankles are extremely convenient and this can be the all occasion shoe in your wardrobe.